Throughout the year, people of all ages experience a minor medical emergencies that cause them pain or discomfort. From sprained ankles to migraines, there are many medical setbacks that require a reliable doctor last minute. When an urgent care event happens, most families turn to a nearby hospital for medical care. Unfortunately, this can often involve long hours of waiting time with other patients who are experiencing an illness or injury. In addition, impersonal care is usually a flaw of hospital urgent care rooms because physicians are rushed to see many patients. 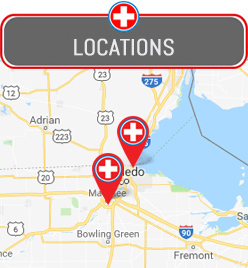 At our Northwest Ohio Urgent Care location in Toledo, OH our urgent care professionals offer a great alternative to hospital urgent care centers. Our medical team can provide you and your loved ones with fast, accessible urgent care services every day of the week during flexible hours. We serve patients of all ages on a walk in basis, including children and seniors. Rather than having you wait for hours on end before a doctor is available, we see to your urgent care needs quickly and efficiently. We know how painful and uncomfortable it can be to experience a last minute medical setback, so we do our best to see you in a timely manner and provide flexible hours every day of the week. So the next time you ask yourself, “Where are all the great doctors near me in Toledo? ?” walk right into Northwest Ohio Urgent Care in Toledo, no appointment necessary! At our Toledo urgent care clinic, we are happy to offer top notch urgent care services offered by a fantastic team of medical professionals. All of our doctors are Board Certified and have years of experience in the fields of emergency medicine and family healthcare, including pediatric urgent care. We have a pediatric urgent care clinic on site, as well as a variety of other beneficial services. Our medical staff is friendly and compassionate, and can provide you and your loved ones with the confidential care and answers that you need during your minor urgent care emergency. Our doctors focus on providing comprehensive care for patients in the Toledo area. We individualize your care based on previous medical history and current needs, and are happy to provide preventive advice as well in regards to your health. On top of our urgent care services for everything from colds to STDs, our doctors offer walk in physicals for patients of all ages, as well as X-rays. We know that scheduling appointments in advance with a primary care physician can be time consuming and not optimal, so we provide convenient alternatives to hospitals. Regardless of your urgent care or primary care needs, our doctors near you in Toledo, OH are happy to provide your family with great medical care! If you have any questions about our doctors, clinic, or services then please do not hesitate to call or visit us today. Our medical team looks forward to helping every patient feel healthier soon!